Ketchvar III’s mission is pretty simple: take over the body of an average American teenager and determine if the human race is worth saving. It helps, of course, that Ketchvar is an alien from the planet Sandoval IV and is the same size and shape as a terrestrial snail. It also helps that he is a trained GC evaluator with over 2,000 years of experience. What complicates his mission is that Tom Filber, whose mind and body he has taken over, is, with his good health and above-average intelligence, anything but average. He is, at best, a misfit at school and at home, and when you’re fourteen, there isn’t much else besides home and school. As Ketchvar gets drawn into the daily drama of teenage life, the line between Ketchvar and Tom begins to blur. Will Tom survive the daily grind of high school on the lowest rung of the social ladder (which includes, among other things, being shoved naked into a garbage can)? Will Ketchvar complete his mission in time to save his father, lost in the ooze of his home planet billions of miles away? Told from Ketchvar’s point of view with wit, empathy, and a large amount of humor, this is a story that will keep young readers, as well as a few older ones, on the edge of their seats. 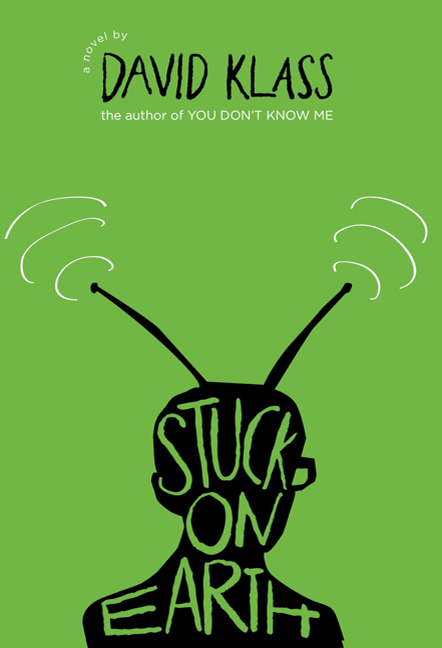 I admit that I picked up this book mainly because of the cover: a metallic green background with the silhouette of a skinny (and therefore, presumably geeky and awkward) teenage boy with glasses and very long antennae. Judging a book by its cover isn’t always a good strategy for selecting books to read, but it worked out this time. I loved every minute of this book and found that just when I thought it was becoming predictable, it went in a different direction that took me completely by surprise. It’s not often that I can say that, especially about a YA novel, many of which are formulaic and predictable. “Where what is?” I ask, baffled. In short, Ketchvar goes through typical alien clichés, and Tom responds with all the typical earthly clichés. There’s a fair bit of irony here, because Tom is lying through his teeth to try to get out of this situation (or so he thinks), but he really does have more in common with Ketchvar than perhaps he realizes. That the human race is going to be judged based on the experiences of an alien inhabiting the body of a boy who is completely ostracized and often brutalized by other members of that race is no small matter. Klass is having a great deal of fun here, though: for Ketchvar, this is just another day at the office: “Right turn, left turn, squeeze through, crawl around, slither over, and there it is! The human brain” (9). On another level, however, there is also a coming-of-age narrative tucked into the story of Ketchvar’s time here on Earth. In fact, the “alien takes over” motif is a nice little metaphor for puberty and the physical, mental, and emotional changes it brings on. While this is not the main thrust of his narrative, Klass seems aware of it and uses it for comic relief and to elicit empathy for both Tom, who is busy having his own difficulties, and Ketchvar, who is experiencing a not dissimilar problem himself. There is a lot of food for thought here. *A brief note is in order here. The original film version of The Thing (whose full title is The Thing from Another World) was released in 1951, and was on the leading edge of all those 50’s B movies that perpetuated a lot of these science fiction clichés that we’re talking about. It is notable for starring James Arness (in one of his first roles) as the Thing, which can charitably be described as an extraterrestrial carrot. John Carpenter remade the film in 1982, and in his version, the alien really does take over human bodies. What is lost in all of this is that all three movies are based on a novella titled “Who Goes There?” by John W. Campbell, the famed editor of Astounding Science Fiction (later Analog Science Fiction and Fact. Since there has been no mention (again!) of this novella as the original source, I will do so here. If you are interested, you can read it online here. It’s a good read, but written for an earlier audience and takes seriously things that we really can’t anymore. **This idea was the plot-of-the-week in a lot of episodes of Star Trek, both the original series and all its other incarnations. Klass, David. 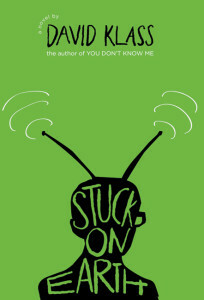 Stuck on Earth. New York: Frances Foster-Farrar Straus Giroux, 2010. Print.